The chickens are holding up OK in our record summer heat. We did lose one to heat stroke, early on… one of the young roosters was trying to be close to Momma while she was trying to lay an egg in the middle of the afternoon, and it was just too much. I set up a stand mister and a fan, which cools off a small section of the back yard. I set it up so that this area is also screened by trees, so it’s not only shady, but safer from hawks. 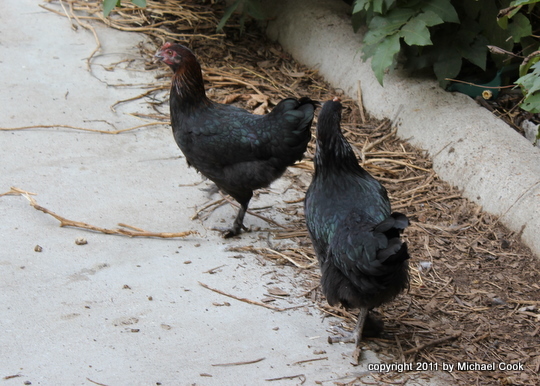 The Marans pullets are growing right along. I have started calling them Cinnamon, Cardamom, and Clove – the Spice Girls. The remaining rooster… was delicious. I had hoped that he would get a little older and more robust before we had to kill and process him, but he was getting too noisy. There’s a misconception that roosters crow *only* at dawn… roosters *start* crowing at dawn. They also crow whenever something frightens or threatens them, whenever they feel the need to prove their manly roosterfulness, or just whenever the joy of song bubbles up from within and cannot be denied. They crow a LOT. Hundreds of times each day. Quite loudly. That’s the main reason that we’re not allowed to have roosters in the City of Dallas. 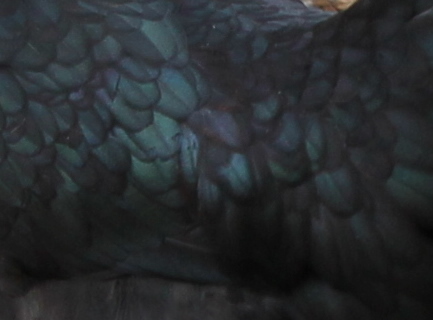 The Marans hens, although not as brightly colored as the roosters, have a lovely iridescent green/purple sheen to their feathers. Freebird looks like she’s picking a wedgie, or trying to impersonate the Escher Dragon. 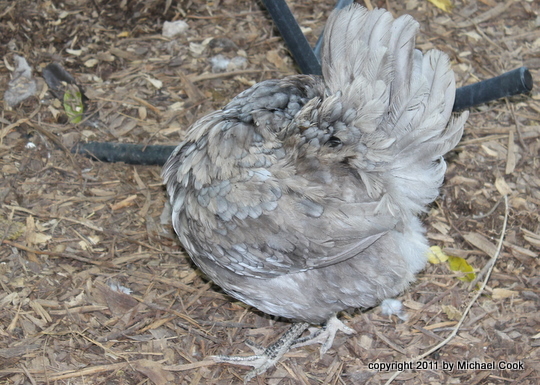 She’s molting by bits, and the new feathers look distinctly blue against the aging yellower ones. 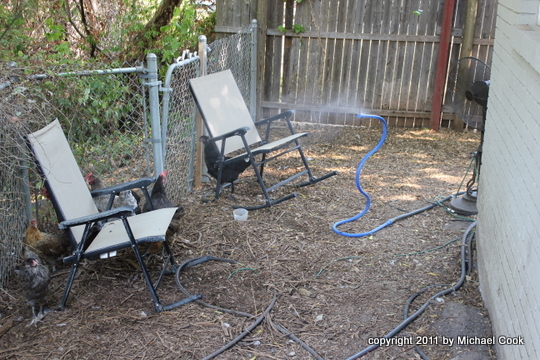 I also set up a brazier that holds enough water for a little wading – the chickens shed heat through their skin, especially on their feet, legs, and combs, so getting their feet wet makes them cooler. 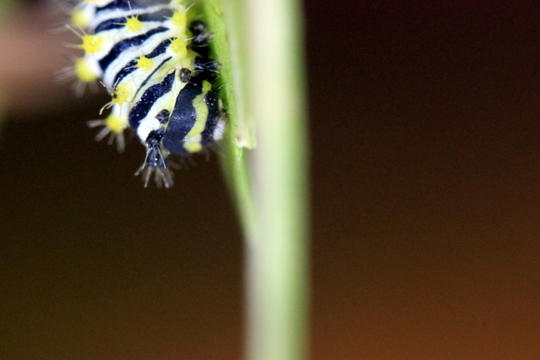 The Promethea caterpillars are chowing right along. They’re getting noticeably bigger; you can tell especially by the proportion of head to body. Their head casings are inflexible, like a helmet, but their bodies stretch – they start out with tiny bodies and huge heads, and end up just the opposite as the body outgrows the head. Then, they shed their skin, and it starts all over with a new bigger head. And this is what the larvae do to a sweetgum branch! 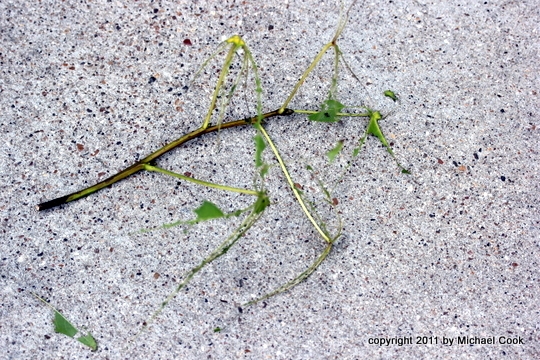 As they grow, I put new branches in their container, and they walk from the old leaves to the new ones. 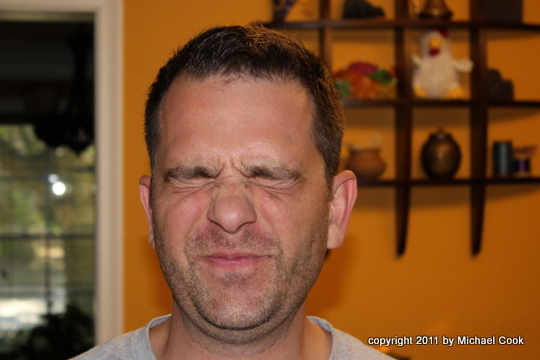 I walked into the kitchen with the camera from taking chicken pictures, and Chris didn’t even have time to duck – he just kind of flinched. I think it’s a good picture of him, though! Behind him is the new chrome-yellow wall of the kitchen; he painted all the downstairs rooms in new, rich colors. 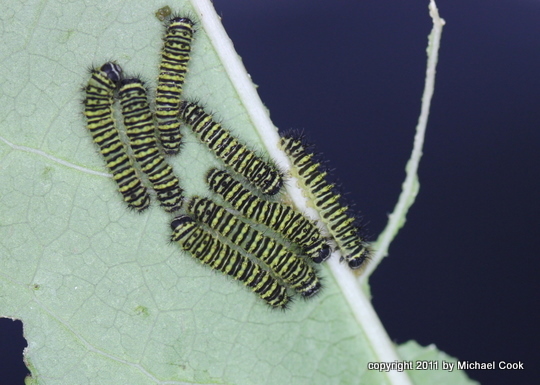 The Promethea caterpillars are changing to second instar. They’re seven days old. 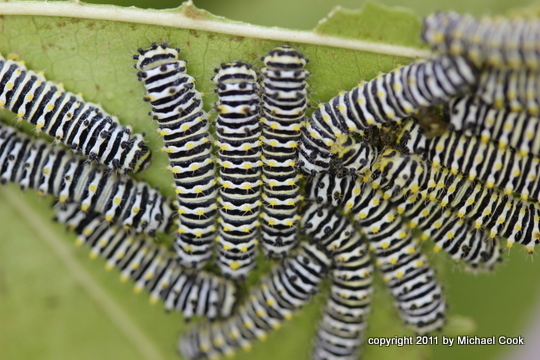 They have not all shifted yet – they may have hatched across two days, or some may just be a little delayed. 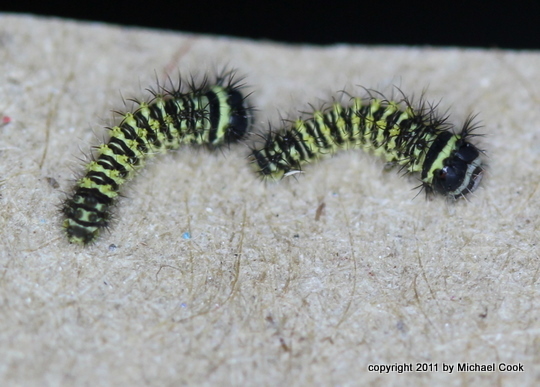 You can see that the remaining first-instar caterpillars are smaller, and also yellower than their second-instar siblings. You can see – especially on the stripe behind the head – that they’re beginning to develop a white, flaky cortex – as they get older, it will develop almost into a crust. I don’t know whether this helps to make them unpalatable to birds, or what. The Promethea moth (Callosamia promethea) lives in Texas, but not the part where I live – they want the far-eastern reaches of the state, up against Louisiana. They have a wide range in the eastern US, all the way to the Atlantic. 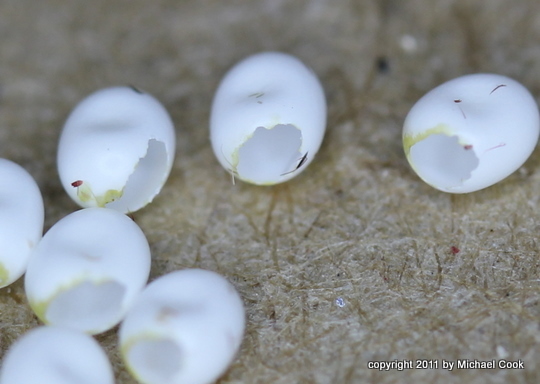 These are the eggs after hatching. They remind me a lot of the Eri silkmoth, Samia ricini and the Calleta Silkmoth, Eupackardia calleta, both of which are cousins of Promethea. 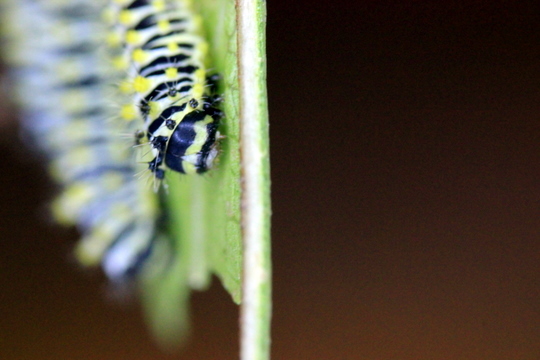 On the day of hatching, the larvae are very big-headed. They tend to be gregarious; they will wander for a while, but then settle in little clumps. They remind me of tiny sheep, the way they line up shoulder-to-shoulder to eat. Although they’re only a day older than the hatchlings, these guys have noticeably lengthened out – and you can see the clumping behavior. 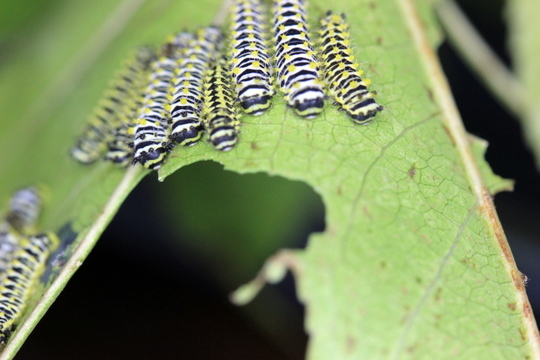 They will stick together like this until they get to the third instar, if they follow the pattern of their cousins… we’ll see as they grow up! These guys tend to prefer tulip tree and sassafras and spice bush – I have them on sweetgum (liquidambar), as I don’t have easy access to the other trees. They seem to be doing OK so far.